Throughout the Long Island area, warehouse owners are moving quickly to make the building energy reducing investments they need to make for business reasons while qualifying for substantial Federal and New York tax savings and utility rebates. Long Island area warehouses owners need to make a series of building improvements in order to remain competitive attract tenants and retain building value. 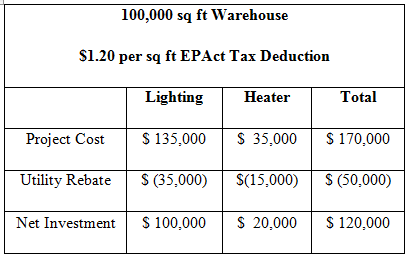 It is important for the warehouse owners making these investments to optimize a series of important tax benefits that are in certain cases only available for a limited time period. Along with servicing its own large 2.5 million population, Long Island is a major support area for New York metropolitan area businesses and is also home to, or adjacent to, four airports. The four airports are JFK, LaGuardia, Islip, and Farmingdale. Excluding LaGuardia, the airports are supported by a strong warehouse market that is relatively immune to economic cycles. As of February 2010, Long Island had a warehouse vacancy rate of only 4.5%, which was the lowest of any major industrial market in the country. Although Long Island warehouse vacancies are low, rental rates have declined and owners need to reduce operating costs to retain tenants and prevent further rent declines. Accordingly, Long Island with its 6,400 warehouses is one of the nation's leading warehouse markets. Although Long Islanders view properly Queens as part of New York City from a geography stand point Queens is part of the Long Island land mass and many leading lighting and HVAC contractors often service Queens’s warehouses from Long Island. Long Island and Queens have some of the highest electricity and heating costs in the country. As result of lighting product technology changes and abundant natural gas these warehouses are retrofitting to substantially reduce their energy costs. The local Long Island and Queens utilities are offering rebates for both lighting and natural gas heater upgrades. On Long island, Long Island Power Authority (LIPA) provides the electrical rebates and National Grid supplies the natural gas heater rebates. In Queens, both Con Edison in a program administered by Lockheed Martin and the New York State Energy Research and Development Authority (NYSERDA) provide the electrical rebates and Con Edison/Lockheed Martin and National Grid supply the gas heater rebates. For both Long Island and Queens, the heater rebates are so called "custom rebates" meaning they are customized to the project and based on natural gas therms saved and in many cases can amount to thousands of dollars when enough natural gas therms are saved. New, improved commercial heating systems can provide energy cost savings of eight percent or more over the ASHRAE 2001 building code standards. There are multiple heater technologies suitable for the warehouse market, including direct fired gas heaters, unit heaters, and infrared (radiant) heaters . If a warehouse requires reroofing this owner should consider a more energy-efficient white roof. Moreover, when reroofing this is the ideal time to consider adding more insulation. If the building already had an energy-efficient design and roof the owner may want to consider upgrading to more energy-efficient truck bay doors and windows. The Kennedy airport facilities infrastructure or Aerotropolis has undergone major improvements in recent years. Besides on airport terminal and parking garage improvements and a monorail train to the plane rail system connecting New York City and Long Island an improved warehouse center is developing. 1)Assemble team including Warehouse experts for EPAct tax incentives, utility rebates, lighting, heater, envelope and solar. 2)See if roof is compatible for solar and heater. Obtain solar and any needed roof/insulation proposals. Make sure existing roof warranties are compatible with solar P.V. installation. 3)Obtain lighting design that replaces all inefficient lighting. Compare and contrast fluorescent, induction and LED lighting alternatives. 4)Obtain Cambridge heater or equivalent design proposal based on proposed roof design. 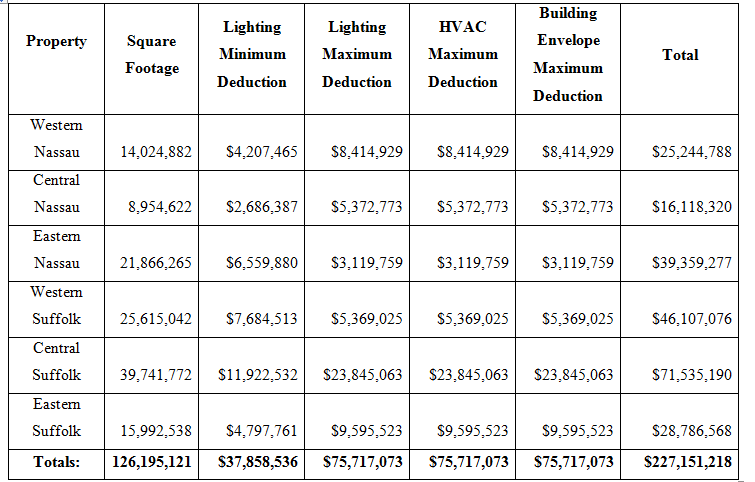 5)Determine utility rebate based on all proposed separate and combined measures. Lighting will reduce electrical use. Roof, insulation and heater will reduce therms. 6)Determine tax incentives including EPAct tax deduction benefit and solar credit tax deductions. EPAct will be based on total project square footage, including mezzanines and pick and pack modules. The 30% solar tax credit will be based on the combined solar material and installation costs. 7)Prepare project proposal integrating project cost, energy savings, utility rebates and tax incentives. 9)Hire contractors and execute project. 10)Have EPAct modeler and tax expert prepare IRS approved software model and tax documentation. 12) Reduce Federal and State estimated tax payments for large tax deductions and credits. 13) Celebrate tax enhanced energy-efficient warehouse achievement. As described above there are multiple compelling reasons including energy and substantial tax savings why Long Island area warehouses are acting on energy-efficient warehouse projects. This is such a widespread phenomenon that market forces will require warehouse landlords to upgrade just to remain competitive. Once the overwhelming majority of warehouses are upgraded America's building products community will undoubtedly turn their attention to the next major building category requiring improvement which may very well be the office building you are sitting in. Charles G. Goulding is an Analyst with Energy Tax Savers, Inc.